Last August I spent the month shooting footage for a music video film for the City of Copenhagen about cycling in the city. I was up on a building to shoot the morning rush hour and took some still shots, too. 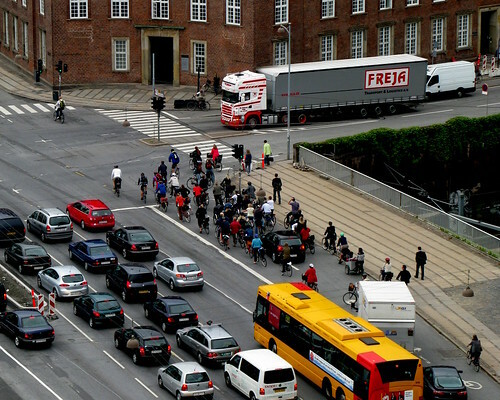 Cycling in rush hour gives you the sensation of being in a school of fish, all rolling together. When viewed from above, it is pure poetry. A ballet. Along the wide bike lanes running parallel to the grand boulevards, where the lights are spread out more, the flow of cyclists comes in waves. From a red light they spread out at various speeds, forming long strings and then they gather in a flock at the next light, only to repeat the movement at the next flash of green. The ebb and flow of bicycle culture. The street is these first three shots is Hans Christian Andersen's Boulevard and it features upwards of 25,000 cyclists each day. There is a constant flow all day long, but during the morning rush hour the concentration of cyclists is high. Most people start work or school at roughly the same time. In the afternoon it is more spread out since quitting time is more organic and less homogenous. The bike lanes on these stretches are very wide, up to three metres or more in places. And that is merely for one-way traffic. The bike lane on the opposite side of the street is similar. In the shot above you'll see many cyclists heading left, positioned in front of the cars and trucks. They are executing a Copenhagen Left Turn. You continue across the intersection to the far side and then turn from there. Usually you wait for green but you are allowed to turn if there is no traffic. As mentioned often before, the motorists are used to bikes - they are cyclists themselves - so this morning frenzy is a calm affair, as a rule. Cyclists wait for the light to change on a separated bike lane. In this instance, the cars shuffle over to the right. 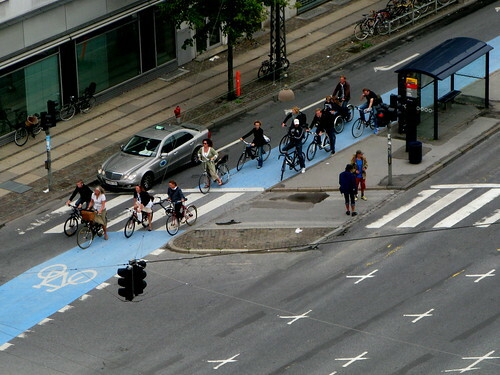 In many intersections on busy streets, the bike lanes blend into the turning lane for cars. The cars are allowed to stop with either space on the right for the bikes or up against the kerb. If a car hugs the kerb, the bikes just flow past on the left. 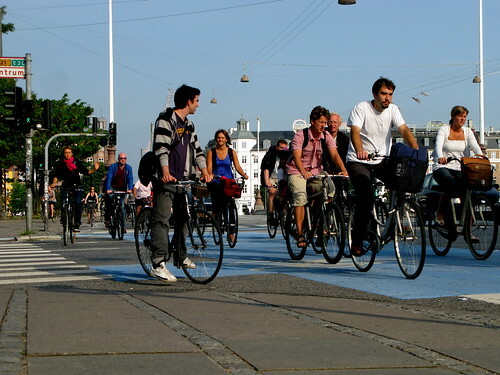 There is no doubt, however, that the bicycles dictate the movement, given their great numbers. In the above shot you can also see a common feature in Copenhagen. The bus stop is positioned on an island, which allows the bicycles free movement. The bus passengers disembark and wait for the light. On narrower streets with these bus islands, they must wait for a hole in the bicycle traffic before crossing to the footpath. 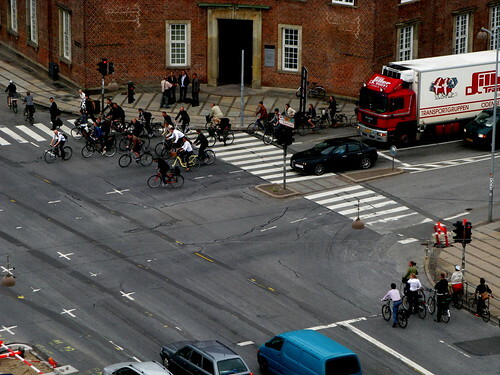 On narrower streets, like this shot of Nørrebrogade, the concentration of cyclists is far higher. You are in a constant school of fish with the 35,000 cyclists on this stretch, given the fact that there are more traffic lights. Although the Green Wave certainly helps the flow.